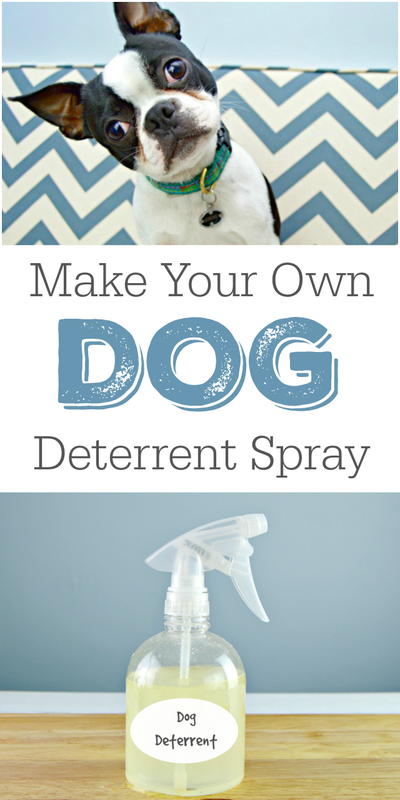 This DIY Dog Deterrent Spray can help stop indoor accidents and keep your dogs from urinating in your home. This fall, we added a new addition to our family. Nash (that cutie you see above), had just turned a year old, and we really felt like he needed a friend to play with. So we added Bentley to the mix. 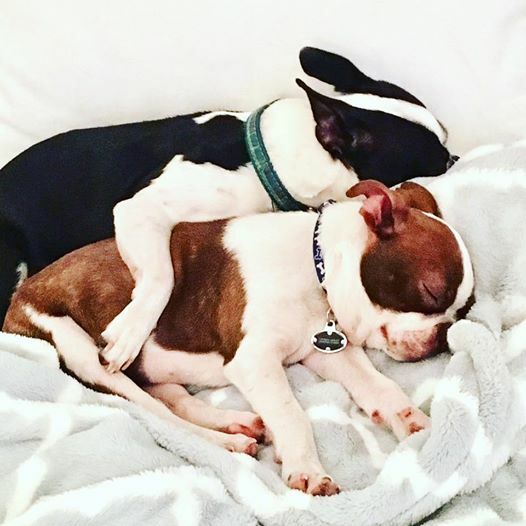 Nash and Bentley immediately became the best of friends and are the sweetest little brothers ever. The only problem…they are both male, and they both want to be the alpha male. That means that they have decided to mark their territory. It originally started outside, then recently, they have moved the party inside. I guess because it’s been raining for over a month, they just aren’t outside as much as they were. These sweet little angels have been peeing on the trash can, on a random leg of our kitchen island, the front bench and also on my curtains. Finally after following them around, constantly cleaning everything for the past few weeks, I needed to figure some things out. The first thing I did was thoroughly clean everything. I laundered the curtain they had decided to mark, and scrubbed the furniture and floors down with an enzymatic cleaner. There are certain cleaners that have enzyme removing agents in them that help keep the dogs from remarking the spot. At this point, I was willing to do anything to get them to stop. The next thing I did was make my own Dog Deterrent Spray. This spray has an orange scent that dogs don’t really love, and I use it to keep them away from any objects (like my curtains) that I really want to protect. Bonus…it smells awesome! 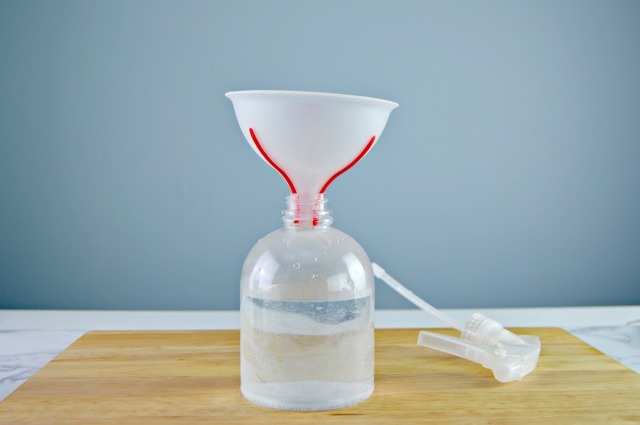 Start by adding your water to the spray bottle. 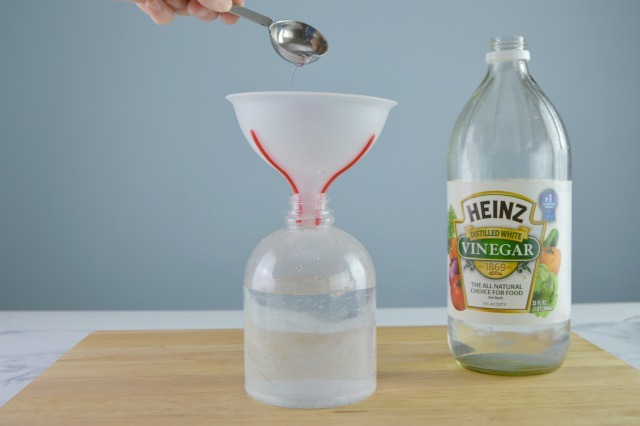 Next, add 2 tablespoons of distilled white vinegar. Finally, add 20 drops of orange essential oil. 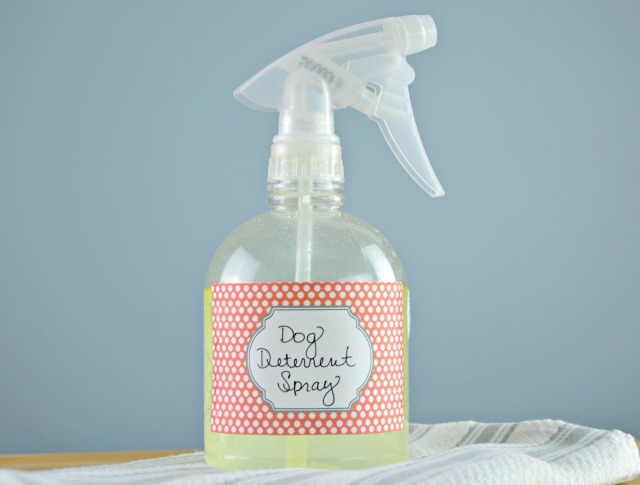 Spray on any surface that you don’t want your dog to get close to. 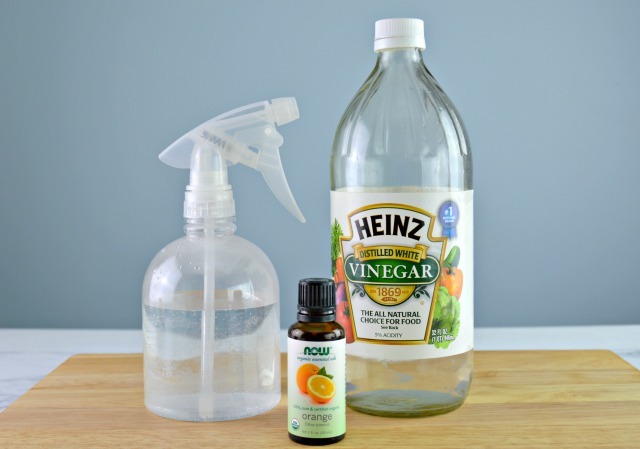 Dogs don’t care for the smell of vinegar or oranges, so using the two together really makes this spray work. It also leaves a nice, citrus scent in the air…win, win! I have been spraying it on my curtains that hang to the ground and around the areas that they were having accidents for about a week now, and it really seems to be working…YAY! I have to tell you…I was about to lose my mind. Y’all know what a clean freak I am, and I was really starting to think that living with peeing dogs was just going to be my life, but this stuff really works! ***BONUS*** If you have dogs the like to chew your furniture, then try this on a small area of the fabric or wood first, then spray away. Dogs don’t like the smell of orange and vinegar, but they also won’t like the bitter taste, so it will keep them from chewing your furniture. Got cats? 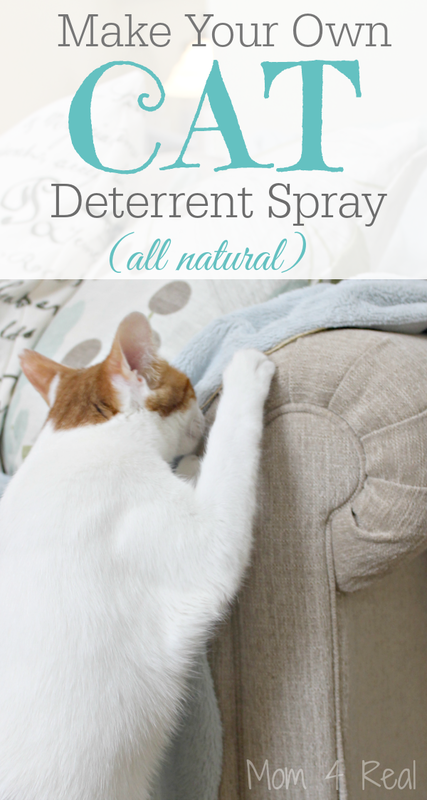 Check out my Cat Deterrent Spray to keep your cats from urinating in certain areas and scratching your furniture! 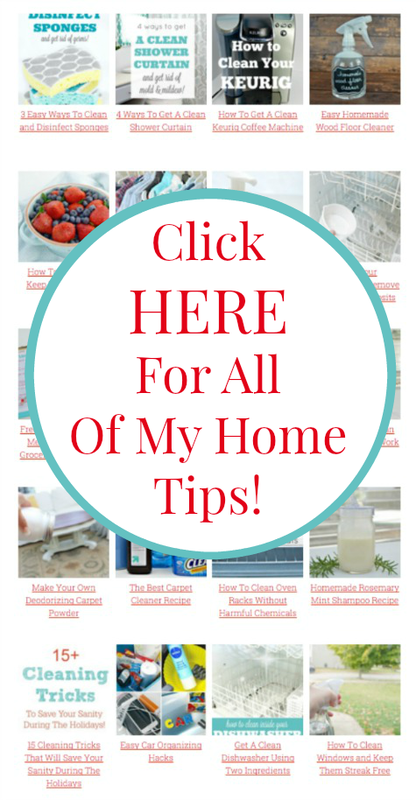 Check out all of my Cleaning Hacks and Home Tips HERE! Could you use lemon oil in place of the orange oil? Thank you! my dogs love oranges so its a no go for me. I need a DEER deterrent! They like the buds and leaves of our corn and tomato plants. HELP, Please!! Irish spring soap, cut into little chunks put into cheese cloth and tie near and around your garden. Irish spring soap, cut into little chunks put into cheese cloth and tie near and around your garden. Its non toxic and works for rabbits, mice and other vermin. Irish spring soap does not stop mice..we had it in our camper over the winter to keep mice away. The mice ate the chunks of soap. I would not recommend this for mice. There animal deterrent sprays at Walmart you can buy. It works and smells bad. I use it around my flower beds. Go to your local barbershop,ask them for the hair they’ve swept up. Very strong human(predator) scent will usually keep them away. Another long-term “fix”, and healthier dogs. Have them neutered. They won’t feel the need to roam, reducing the risk of getting lost, injured or worse, and it decreases the risk of cancer. Check with your Vet. Actually that only helps some times, my 2 month old puppy was fixed before I ever brought him home, as he was a rescue and that was the shelters policy. He still marks his territory in my living room when my dad’s girlfriend brings her dog around. It depends on the breed and how stubborn the breed can be. Too, too true. My bichon-poo and chihuahua min pin have not been deterred. Or maybe they have. Maybe they would have been worse. Coukd this be used on carpet? Does this also work on rugs/all rug types? We just rescued a puppy and she is literally chewing on all our furniture and rugs. Will give this a try and hopefully it really deters her from biting! Is there a reason you didn’t use Nature’s Miracle as the enzymatic cleaner? That’s what we have on hand and wondering if you’ve found the cleaner you recommend to work better. Also, do you need to use a glass spray bottle for essential oils? This is great advice! We just added a female dog to our household and our male has been marking the place up everytime I clean the carpet! How often do I need to spray your formula? We have a 12 week old puppy! He’s doing ok, but could be better! Thanks! May this be used on area rugs safely? Have new rugs and don’t want to damage them! What I’m about to say may be silly but I’m new, never had a pet before owner so stick with me, please. Our puppy will spend hours outside with my husband in the courtyard or go for walks however 30 seconds in the house he pees on the tiles. It’s driving us mad but we are not getting angry & try all the suggestions of friends, the trainer, the vet & websites without any success. I will try our recipe though I want to puppy the be able to use the back room where the tiles are if I spray where he is toileting he won’t want to be in the room, will he? All assistance from you & your readers would be very much appreciated. Hi, Jennifer! Oh do I ever feel your pain on this one. Our first puppy, Nash was so good about never using the potty inside, but our second, Bentley…not so much. I use this to keep him away from certain areas, but if he smells his urine there from before, he will think it’s ok. Make sure to clean the area he is using really well, and use this spray. Let me know if it works for you!! Good luck! I just wanted to know how often to use the homemade doggie deterrent. Will the spray leave a residue that will attract dirt and dust? Hi I have 5 little schnoodle mixes 3 males and 2 females. They at times het i to this mood of urinating eveywhere inside the hous see. Wetting the beds all over the room. Its just at times because they are usually pretty goos at going outside. What can I do to stop this. Iwe are almost daily washing beds and blankets they use and its exhausting. Pmease any advice or remedies that are effective. Have you used it on laminate or hard wood floors? I wouldn’t spray any liquid on laminate or hard wood floors because it could warp them. I just spray on carpet and fabric. I have an older dog n lately shes started urinating all over the carpet? I need a fix for her? What will deter her from doing this?Thanks in advance! Hello, your list of “what you’ll need” includes Enzymatic spray, but is that only to clean areas ahead of time that have been soiled? I am getting ready to replace an area rug that my dogs have chewed several times over the years. I’d like to spray the new rug right away to keep them from fussing it. In this case I won’t need an enzymatic spray, correct? Thanks! Correct…the enzymatic spray is to remove the previous urine smells. This is fantastic… Thank you! I figured there has to be something better than just the enzyme cleaner that could be used indoors to deter this little newbie (1 year old rescue) from peeing inside. Working with a trainer and using a crate, but I would like to speed up her reaching successful potty training. She is driving us bonkers…. especially with all the rain we have had this week (NC). I read that orange essential oil is toxic for dogs when diffused or ingested. Is this safe because of the dilution? Also, how often can I or need to repeat? I’m at my wits end with potty training. 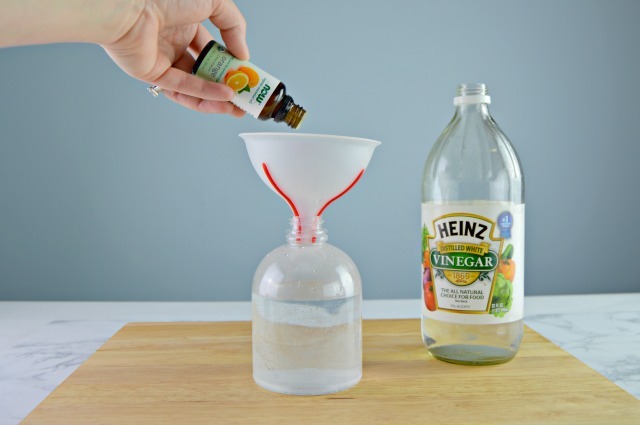 Can ammonia be substituted for the distilled white vinegar?